Photo Courtesy of Spartanburg County Public Libraries. You could literally call it the rule of thumb: if the river cane growing in the bottomlands of your farm were thicker than your thumb, you could rest assured that the soil was rich enough for years of good farming. The hearty Scots-Irish settlers who cut through those canebrakes in the 1770s found clean, fast-flowing rivers and a thick topsoil throughout most of what would become Spartanburg County. In this former Cherokee hunting ground, pastures were common too, with cattle herds taking the place of native buffalo. Back in those days, if you didn’t mind living in a lawless frontier in the midst of a national crisis, the living was easy: plentiful game, good fishing, and bountiful soils that yielded grains and produce with little effort. Bad roads made it a long haul to Charleston to trade crops for cash, but subsistence farming was never easier. As inland markets developed in the early 1800s, those early generations planted a wide mixture of cash crops. Early records note rich crops of grains, tobacco, indigo, hemp, and peas. Corn liquor was a top seller too. After all, it’s easier to haul a few jugs than a wagonload of corn. That would all change after railroads arrived in the middle-1800s. With the transportation struggles of earlier days overcome, cotton became the big money-maker, especially as textile mills sprouted on almost every local river. With a ready buyer just down the road, nearly every Spartanburg County farmer turned to King Cotton. But sad to say, that’s when the trouble started up. Without careful management, year after year of cotton farming gradually eroded away the topsoil, clogging up rivers and exposing a less fertile red clay subsoil. All that cotton also made good eating for a pesky bug that swept through Spartanburg County in the 1910s and ‘20s: the boll weevil. It was time for another big change. This time, with the help of the Soil Conservation Service, diversification became the mantra of Spartanburg County farmers. Many turned to a harvest that didn’t require yearly plowing: the peach. 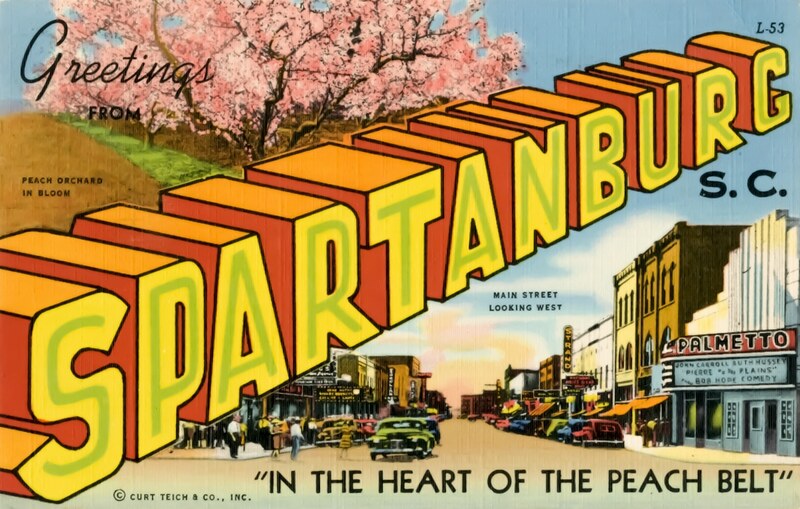 In fact, by the 1940s, Spartanburg County could boast that it was the fresh peach queen of the United States, producing more that the whole state of Georgia. We’ve even got a monument to prove it. Today, Spartanburg County farming runs the gamut: livestock, timber, peaches, just about anything under the bright South Carolina sun. And those old Scots-Irish farmers? Well, they are still here growing nature’s bounty. Come out and see for yourself as you explore the Grown In Spartanburg tour! By Brad Steinecke, underachieving gardener, avid peach eater, and Assistant Director of Local History for the Spartanburg County Public Libraries.